What's more exciting than the first mtb race of the season?? Getting to race on a brand new bike! While I was sad to see my S-works Stumpjumper go, I am super happy to be making the switch from 26in to 650b wheels. So what did I get? 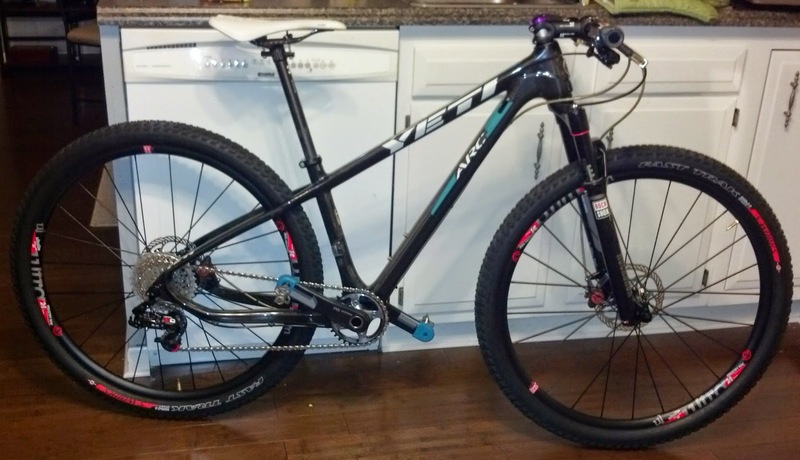 A Yeti Arc Carbon! I've been drooling over the frame while it's been sitting down in my basement waiting to get built. Of course some of the parts took their sweet time getting here and it was a last minute scramble to get the bike built - thank you Aaron (aka best husband ever)! I officially deemed myself a bike nerd when I got the most excited by the fact my new Industry Nine wheels/hubs have even more points of engagement than the Chris King hubs I had before (which I loved by the way). Not long ago I wouldn't have had a clue what that even meant ;) For the rest of you bike nerds I (ahem, Aaron) will post some build details soon! So back to the race - I've said it before, and I'll say it again- I really enjoy racing in Illinois. Tony Thaller does an excellent job with the series, his wife Amy is a superb official, and I love the ladies that race in the expert field. Not only are they friendly, but provide great competition. The guys are pretty darn nice too. This race was at Matthiessen state park. The trails here are great, you get your fast and flowy sections, fun downhills, some technical areas and a crazy three part climb up out of the river valley. I don't know what it is about this climb, but I actually like it. Yeah, I know, I hate climbing. I can't explain it. So, I went into this race wanting vengeance. Last year I was having a spectacular race at this course and then had to DNF due to a crazy derailleur shearing off incident... I was bound and determined to not let that happen again! Beverly, Melinda and I lined up together. A very small field, but three of were actually the top three from last year's overall series, so I knew I would have to work hard to do well. I took the hole shot into the singletrack with a tiny gap and tried to keep pace with the back of the men's expert field (we all started together). While trying to be cautious and not have repeat of last year, I kept pushing my pace trying to open the gap, or at least not get caught. I was working pretty hard and was slightly worried I wouldn't be able to keep up the same pace. I decided now was as good of time as any to learn my limits. If I blew up and couldn't finish by lap four I would know I pushed too hard. If not, well then I would know I could handle the pace. I made it to the crazy long climb at the end of the lap (the one I kinda enjoy) and worked my way toward the top. I took a quick glance below and tried to gauge how big of a gap I might have. I thought I saw one of the chasing girls getting ready to start the climb but couldn't tell for sure. I keep going as fast as I could down the straightaway and dove into my second lap. I kept reminding myself to focus so I wouldn't make any stupid mistakes. From time to time I would hear someone approaching and would worry I had been caught. But each time it was one of the men from the sport race. Halfway through the fourth and final lap the leader of the Expert men came through, which happened to be Kevin, and shortly after the chase group, which included Aaron. Aaron gave me a "nice job Babe" or something like that and I could hear one of the other guys asking if I was Brittany. For a moment they totally thought Aaron was hitting on Kevin's wife. Too funny! I made it up that final climb one last time and crossed the finish line in first place! I definitely got my vengeance on the derailleur eating course! Yay, I finished with a smile instead of tears this year! Wow what an amazing experience it will in mountain riding. Anyone can't just imagine it. Thanks for sharing this.